Built in 1975, she was completely refurbished by the manufacturer in 1995.
a new factory paint job, top and bottom, was applied. 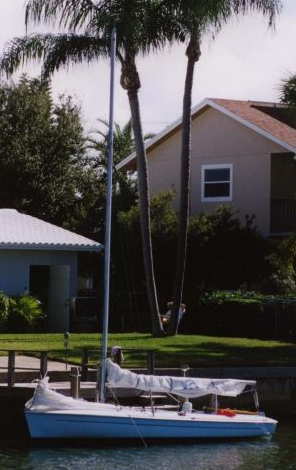 A Fisher jib and main, circa 1990. Main has reefs installed. Two spinnakers: a North from 1993, and a Sobstad from earlier. Complete with spinnaker pole and rig. Paddle, anchor and anchor line, 2 fenders, and 3 life jackets. Upgraded aluminum Trailex trailer, with spare, which has been meticulously maintained. The one thing she is lacking is a good boat cover. We have stored her indoors as long as we have owned her, and haven�t used the old cover much. Flying Scot offers several styles of cover starting at $197, or you could probably find a good used cover from a fellow Scot owner. This is a perfect daysailer for one to six people, and in good condition for racing. The trailer has been meticulously maintained, and is registered in Texas.